Hanging Monastery stands at the foot of Mt.Hengshan, 5 kilometers (3miles) south of Hunyuan County, and 65 kilometers(40 miles) from downtown Datong City. 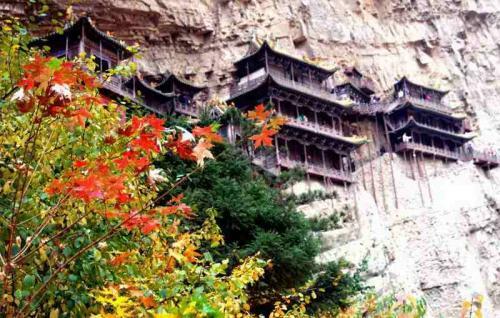 Since it hangs on the west cliff of Jinxia Gorge more than 50 meters above the ground, it is called Hanging Monastery. How could a building like this withstand the winds and storms of so many years? Hanging Monastery is an architectural wonder. A unique mechanical theory was applied to building the framework. Crossbeams were half-inserted into the rock as the foundation, while the rock in back became its support, Seen from below, Hanging Monastery appears to be a tumble-down castle in the air. Inside, Hanging Monastery provides the same scene as other temples. Construction experts from countries including Britain, Germany, and Italy, come to see the monastery. In their words, Hanging Monastery, which mixes mechanics,aesthetics,and Buddhism, is rare. The monastery and everything it symbolizes embodies a great cultural achievement of Chinese people. The second attraction of Hanging Monastery is that it includes Buddhism, Taoism and Confucianism. Inside the monastery, the sculptures of Sakyamuni, Confucius and Laotzu appear together, which is unususl. There are 40 halls and cabinets, which contain about 80 sculptures made of copper,iron,terracotta, and stone. The features are vividly carved.